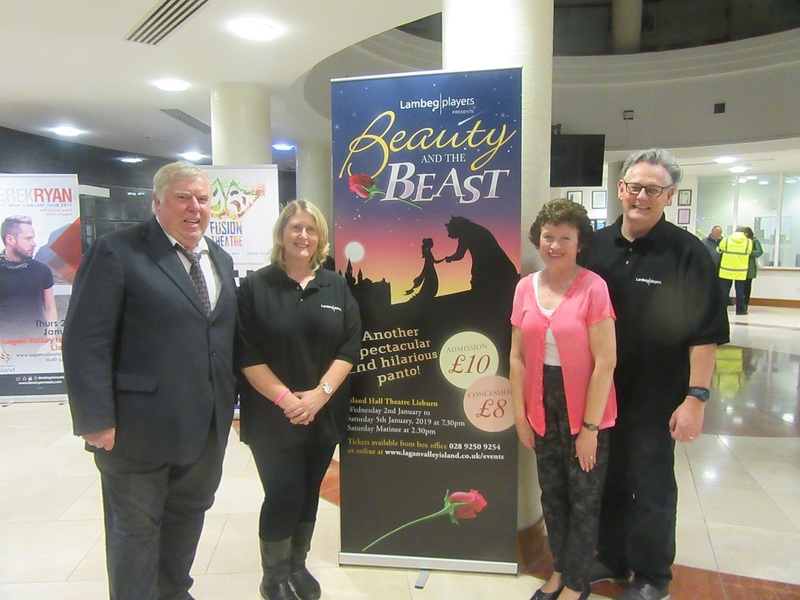 The Lambeg Players Beauty and Beast went ahead in the Island Hall from Wed 02Jan18 to Sat 05Jan18 with “Sell Outs” and “Standing Ovations” every night. The Island Hall Theatre in Lagan Valley Island is a purpose built venue situated on an island between the Canal and the River Lagan. A big “Thank You” to the Lambeg Players and especially Della and Jasper McKinney for the “Orange Bucket” fundraiser traditionally at the end of the last two shows. They will always remember the really important support that S.O.F.T. Ireland gave them when their son Joshua was born with T18. Alex and Paula attended on the Saturday night to enjoy a professional and highly entertaining show. They also represented S.O.F.T. to show our appreciation for their kind gesture. S.O.F.T. got a great “Shout Out” from the stage and big “Write Up” in their programme.